Intracranial dural arteriovenous fistula (DAVF) is a unique vascular malformation that is supplied by dural arteries and drains into venous sinuses or meningeal veins. It differs from pial arteriovenous malformation, in that “nidus” is not present in the parenchyma and feeders should include the dural arteries. Although its pathogenesis remains unclear, a relation with venous sinus thrombosis has been repeatedly reported (1–4). One possible explanation for DAVF formation is that it develops as a result of a process of thrombosed sinus recanalization (1, 2). It is generally believed in DAVF patients that intracranial hemorrhages or other aggressive CNS symptoms—including focal neurologic deficits, seizures, intracranial hypertension, and altered mental status—are attributable to leptomeningeal venous drainage or passive venous hypertension (3, 5–10). Previous studies on DAVF classifications (5, 8, 11) have been based on venous drainage patterns evaluated by conventional angiography and showed that high-graded types with retrograde leptomeningeal venous drainage (RLVD) were related to aggressive neurologic symptoms. Contrary to numerous angiographic studies that have dealt with the involved vascular anatomy, or its pathogenesis and prognosis, relatively few investigations have reported MR imaging findings of intracranial DAVFs in the English-language literature (12–15). Moreover, available studies did not detail their findings or indicate how frequent these findings were. In addition to clarifying the MR imaging findings of DAVFs, it may also be clinically helpful to determine aggressiveness by MR imaging, because this may guide urgent angiography and prompt therapy to avoid intracranial hemorrhage or quickly recover this possibly treatable disease. For these reasons, we studied the MR imaging and MRA findings of DAVFs and sought to identify features predictive of the aggressive type. The study population consisted of 27 intracranial DAVF patients who were diagnosed by conventional angiography and underwent MR imaging. There were 12 men and 15 women, ranging in age from 17 to 77 years, with a mean age of 52 years. We retrospectively reviewed the medical records, catheter angiographies, and the MR images of all 27 patients. Medical records were reviewed with respect to demographic characteristics and presentations, which were characterized as aggressive or benign. Hemorrhage, focal neurologic deficits, seizures, intracranial hypertension, and altered mental status were considered aggressive presentations, and an isolated headache or ocular symptom was considered benign. Catheter angiographies were thoroughly evaluated to determine DAVF location and to type DAVFs according to a previously proposed system (11)—ie, type I, venous sinus or meningeal vein outflow only; type II, venous sinus or meningeal vein outflow and RLVD; type III, RLVD only. All angiographies were performed in at least 2 orthogonal planes. MR images were obtained with 1T (n = 1), 1.5T (n = 25), and 3T (n = 1) machines. Image acquisition was performed in at least 2 planes in all patients and with contrast enhancement in 25 patients. T1-weighted images were obtained by using the following parameters: repetition time (TR) of 500–800 msec and echo time (TE) of 15–30 msec, field of view of 18–24 cm, section thickness 3–5 mm, and a matrix of 256 × 256 or 256 × 192. T2-weighted images were obtained by using the following parameters: TR/TE, 3500–5000/90–130; field of view, 18–24 cm; section thickness, 3–5 mm; matrix, 256 × 256 or 256 × 192. Fluid-attenuated inversion recovery (FLAIR) or proton-attenuation sequences were available in some cases. MRA was performed by using 3D time of flight (TOF; n = 10) or contrast-enhanced (n = 1) techniques after spin-echo (SE) imaging. The imaging parameters used for 3D TOF technique were as follows: TR/TE, 25–45/6.4–7.2 msec; flip angle, 20 or 25; field of view, 21 cm; partitions, 64; section thickness, 1.2–1.6 mm; matrix, 256 × 192 or 256 × 512. Some of the contrast-enhanced MRA parameters were recorded on copy films, all of which were TR/TE of 3.8/1.3 msec, field of view of 17.5 × 28 cm, section thickness of 1.6 mm, and matrix of 256 × 192. Imaging processing was done by using the maximum-intensity-projection (MIP) algorithm. MRA evaluations were initially performed by using MIP collapsed orthogonal and oblique views. 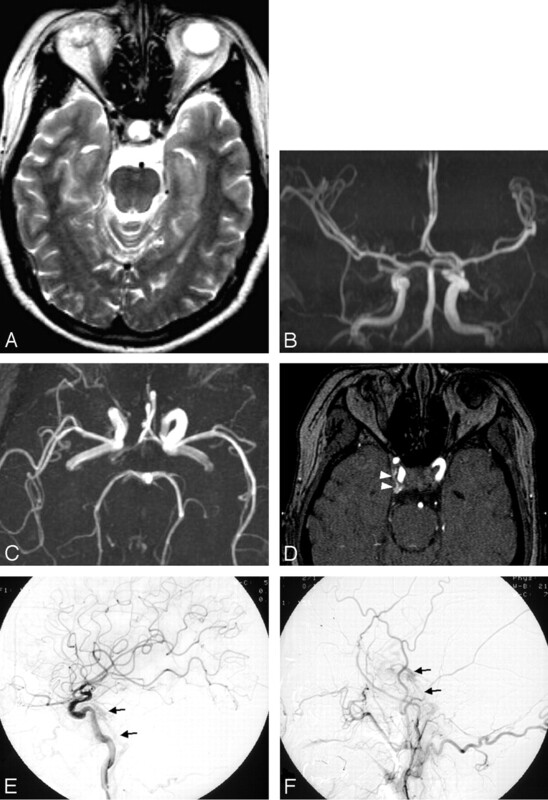 The variables evaluated on examinations were as follows: on catheter angiograms, locations, and types; on MR imaging, flow void cluster near the dural venous sinus (Fig 1A, -B), engorged ophthalmic vein or proptosis (Fig 1C, -D), white matter hyperintensity (Fig 1E, -F), intracranial hemorrhage, dilated leptomeningeal or medullary vessels (Fig 1G, -H), venous pouch (Fig 1I, -J), and leptomeningeal or medullary vascular enhancements (Fig 1K, -L); and on MRA, identifiable fistula defined as a focal vascular tangle of flow-related enhancement near the dural venous sinus, venous flow-related enhancement, and prominent extracranial vessels (Fig 2A, -D). MR imaging and MRA were reviewed in a blinded fashion for DAVF locations and shunt amounts. These evaluations were performed by 2 neuroradiologists (B.J.K., M.H.H. ), and discrepancies were resolved by discussion and consensus. Presentations and MR imaging findings of the type I, II, and III cases were compared, and MRA findings were compared between cases with and without RLVD (χ2 test). Presentations were ocular symptoms (n = 11), tinnitus (n = 5), hemorrhage (n = 8), seizure (n = 2), focal neurologic deficit (n = 3), altered mentality (n = 2), and intracranial hypertension (n = 1). Combined presentations were also observed: ocular symptoms and tinnitus in 2, ocular symptoms and hemorrhage in one, hemorrhage and altered mentality in one, and hemorrhage and focal neurologic deficit in 2. One case was incidentally found by conventional angiography, which was performed as a preoperative examination for olfactory groove meningioma. In total, aggressive symptoms were present in 14 (52%) patients. One patient with intracranial hypertension presented with a progressively reducing visual acuity, for which the patient had consulted physicians several times, but intracranial hypertension was not diagnosed for 2 years, when a retinal examination showed papilledema (Fig 2E, -F). DAVFs were solitary in 26 cases; these were located in the cavernous sinus (n = 11), transverse or sigmoid sinus (n = 8), superior sagittal sinus (n = 2), anterior skull base (n = 1), tentorium (n = 2), superior petrosal sinus (n = 1), and foramen magnum (n = 1). One multiple DAVF case had fistulas in the superior petrosal sinus, transverse-sigmoid sinus, and jugular bulb. 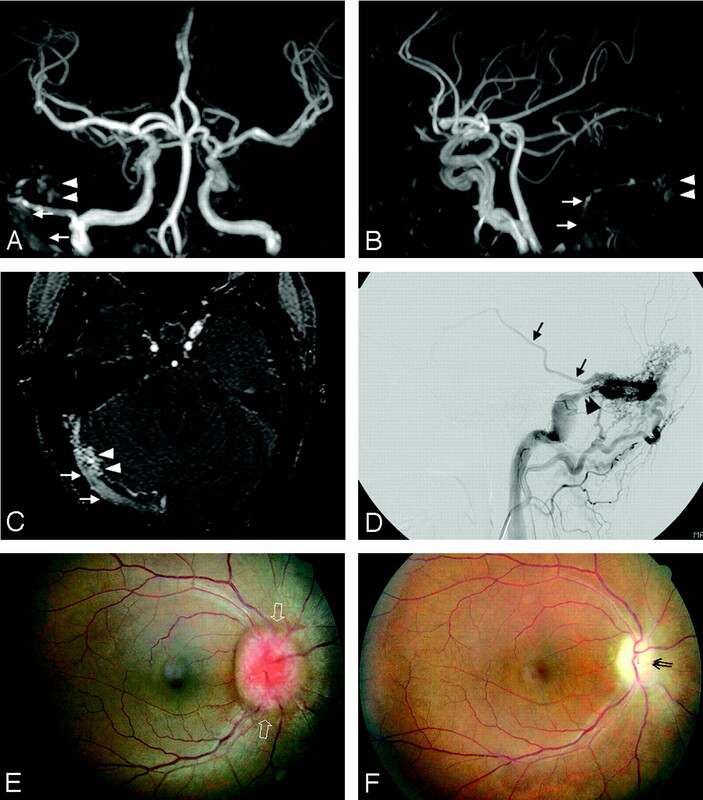 By conventional angiography, 8 cases were type I, 12 type II, and 7 type III. In the multiple DAVF case, the transverse-sigmoid sinus fistula related to the presentation was chosen for typing. The cavernous sinus was the most common site for type I (75%) and type II (42%) cases. Three transverse-sigmoid sinus cases, 2 tentorial cases, one anterior skull base case with a varix, and one foramen magnum case with a varix belonged to type III. DAVF locations are illustrated with types in Table 1. The time interval between MR imaging and conventional angiography was variable (range, 0–60 days; mean, 15 days) and was 7 days or fewer in 16 cases, and >1 week in 11 cases. Of these 11 cases, 8 were symptomatically stationary during the time intervals and 3 already had intracranial hemorrhage on MR images and were stationary with conservative treatment during the interval. Flow void clusters were observed in 22 (82%) by MR imaging. In 5 (18%) cases without flow void clusters, 2 were type I, 2 were type II, and 1 was type III. Engorged ophthalmic vein or proptosis was present in 8 (30%) cases on MR imaging, 7 of which were present in the cavernous sinus and one in the transverse-sigmoid sinus. The frequencies of the remaining findings were as follows: white matter hyperintensity, 4 (15%); intracranial hemorrhage, 8 (30%); dilated leptomeningeal or medullary vessels, 12 (44%); venous pouch, 2 (7%); and leptomeningeal or medullary vascular enhancements, 11 (41%). On MRA the fistula was demonstrable in 5 (45%) cases, venous flow-related enhancement in 10 (91%), and prominent extracranial vessels in 4 (36%). Only a single case was false-negative on MIP MRA images, because it was determined by venous flow-related enhancement (8%). By contrast, no false-positive dural AVF was found at the other intracranial sites in all cases. Overall, MRA assessment for dural AVF was adequate for both fistula and venous flow-related enhancement in 10 cases (91%) and inadequate in a remaining case with contrast-enhanced MRA because of the fistular location out of field. In a false-negative case on MIP MRA images, source images of MRA were available and revealed venous flow-related enhancement. This case was of a cavernous sinus fistula with low flow and small amount of shunt by conventional angiography (Fig 3). Aggressive presentations were more frequent with increasing type (P = .002): one (12%) in type I, 6 (50%) in type II, and 7 (100%) in type III. The MR imaging findings that were significantly different among types were dilated leptomeningeal or medullary vessels (P < .001) and leptomeningeal or medullary vascular enhancements (P < .001). Engorged ophthalmic vein or proptosis was most frequent (6 cases) in type II (50%), 5 of which were located in the cavernous sinus. This, however, was not seen at all in type III. White matter hyperintensity (n = 4) always accompanied dilated cortical or medullary vessels (n = 12) and leptomeningeal or medullary vascular enhancements (n = 11). These results are summarized in Table 2. Only an identifiable fistula by MRA was found to be significantly frequent (P = .015) and to be present only in cases with RLVD (67%). Prominent extracranial vessels also showed marginal significance (P = .061). MRA findings are summarized in Table 3. Intracranial DAVF, a treatable vascular disease, accounts for 10%–15% of all intracranial vascular malformations (16). Although several studies have reported spontaneous regression or rare conversion to aggressive type in a benign DAVF (17–19), a DAVF with RLVD and aggressive neurologic symptoms necessitates a prompt treatment. Despite its reversibility by various treatment modalities—including conservative (20), endovascular (21), surgical (22), radiation (23), or combined (24) therapies—it may be difficult to diagnose DAVF at an early stage in clinical practice because of its nonspecific clinical and imaging findings. The clinical features of DAVFs range from mild complaints such as headache, vertigo, or tinnitus to disabling neurologic deficits or a life-threatening intracranial hemorrhage (8). Likewise, the spectrum of MR imaging findings is also variable, ranging from no demonstrable lesion to intracranial hemorrhage or venous infarction (12, 13). A high index of suspicion for the possibility of a DAVF is warranted when one is confronted with an unexplainable constellation of neurologic complaints and deficits. To the best of our knowledge, no large-scale analysis of the MR imaging features of DAVFs is available in the English-language literature. De Marco et al (12), in a 12-case study, concluded that dilated cortical veins without a parenchymal nidus on MR images are suggestive of DAVF with venoclusive disease. They also described that dilated cortical veins were observed on MR imaging in all angiographically proved cases but failed to directly identify the fistula by MR imaging. In addition, they described venous infarct, hemorrhage, or hydrocephalus as DAVF-related complications. In other words, DAVF might not be detected without the presence of a dilated cortical vein, hemorrhage, or parenchymal change on MR imaging. These findings seem to be more directly associated with complications of venous hypertension than DAVF. Unlike De Marco et al (12), Chen et al (13) pointed out that a fistula was directly visualized by MR imaging in 4 and by MRA in 6 of 7 patients. They regarded the fistula as a slightly irregular region of flow voids on MR imaging or as flow-related enhancement along the involved sinus on MRA, and confirmed this by conventional angiography. Our results also show high frequencies of direct fistula visualization regardless of DAVF type (75%–86%). We should, however, add that this may have been related to the fact that our reviewers were informed in advance of the presence of DAVFs. Nevertheless, our results suggest that any suspicious flow void cluster around the dural venous sinus should alert one to the possibility of DAVF, and lead to further work-up—ie, MRA and conventional angiography. RLVD has been reported to be associated with aggressive symptoms in DAVF patients (3, 6, 7–11). This association was also validated by a single-center study that tested the validities of 2 proposed classification schemes based on venous drainage patterns (25). Our results are also in accord with these previous observations. Type II and III cases with RLVD showed aggressive symptoms more frequently than type I cases—ie, 6 (50%) and 7 (100%) versus one (12%). All 6 aggressive type II cases were noncavernous sinus fistulas, and the 5 remaining nonaggressive cases were cavernous sinus fistulas. Therefore, all cavernous sinus DAVFs resulted in nonaggressive presentations, even in type II. The variable anatomies of cavernous sinus drainage routes—which include orbital, inferior petrosal, or midline-crossing venous drainages—may explain the nonaggressive presentations of cavernous sinus DAVFs. Orbital venous drainage and the ensuing ocular symptoms may lead to the early detection of DAVFs before venous hypertension develops through the RLVD system; moreover, the presence of various drainage routes may reduce venous hypertension by dividing venous outflow. In addition, the fact that our cases had no superior petrosal sinus drainage might have played a role in the nonaggressive presentations of all cavernous sinus cases, because CNS symptoms in cavernous DAVFs are highly associated with superior peterosal sinus drainage (26). It is generally more efficacious to detect and treat DAVF before aggressive symptoms manifest than to recover DAVF patients with aggressive presentations. In our cases, there was such a case of type II superior sagittal sinus DAVF. The chief complaints in this case were of tinnitus and palpable cordlike lesions in the scalp; no aggressive symptoms or signs were present. Conventional angiography showed a type II superior sagittal sinus DAVF. MR imaging was normal but showed a flow void cluster in the vicinity of the superior sagittal sinus. After one session of transvenous endovascular treatment, the fistula disappeared and the patient became asymptomatic without any complication. In contrast with this case, all other type II noncavernous and type III cases were diagnosed when they presented with aggressive symptoms. Our study shows that the MR imaging findings of DAVFs are closely related to type, and, the higher the type, the more common the findings such as white matter hyperintensity, hemorrhage, dilated vessels, venous pouch, and vascular enhancement; however, only 2 of these findings—namely, dilated vessels and prominent vascular enhancements—were found to be significantly frequent in increasing type. Although all type II and III cases, particularly with aggressive symptoms, had at least one of the above findings, most type I and II cases with nonaggressive symptoms showed only flow void clustering, an engorged ophthalmic vein, or proptosis. Therefore, if dilated vessels or prominent vascular enhancements are present on MR imaging, there is a high probability of type II or III with RLVD, and the patient concerned requires a prompt examination by conventional angiography. We believe that dilated leptomeningeal or medullary vessels may be RLVDs or congested medullary veins related to venous hypertension. The medullary veins on MR imaging may be associated with a pseudophlebitic pattern on conventional angiography, which is seen during the venous phase and reflects venous congestion and is related to an aggressive presentation and white matter T2 hyperintensity (27). Had our study population been larger, white matter hyperintensity might have been identified as a distinguishing feature among type I, II, and III cases, but it had marginal significance only in the present study (P = .06). White matter hyperintensity seems to be a relatively late-presenting feature because all white matter hyperintensity cases (n = 4) had dilated vessels (n = 12) and prominent vascular enhancements (n = 11) on MR imaging, but not vice versa. The role of MRA in diagnosing DAVFs is to improve noninvasive screening by detecting flow-related enhancement (13, 14). In addition, phase-contrast MRA may enable the more confident identification of dural sinus stenosis or of occlusion with low-velocity encoding and may provide an effective way of assessing venous flow reversal with phase reconstruction (14). We analyzed flow-related enhancement in 2 separate parts—ie, the fistula and venous structure—and identified a fistula in about a half of all cases. Fistular flow-related enhancement was not present in type I cases but was found in some type II or III cases with RLVD and was the only statistically significant finding capable of distinguishing cases with and without RLVD. This significance might be related to a confounding factor because cavernous sinus DAVFs with relatively low flow shunts and fine feeders were more frequent in cases without RLVD than in cases with RLVD (80% vs 17%). In contrast to the fistular flow-related enhancement, venous flow-related enhancement was observed in most cases (91%) and in all cases if additionally evaluated by using MRA source images. The lack of venous flow-related enhancement in one case was presumed to be associated with a low flow status in the cavernous sinus DAVF. Therefore, regardless of location, DAVFs would be better appreciated on MRA by detecting venous flow-related enhancement. With the advent of more advanced interventional devices and techniques during the past decade, increasing reliance is being placed on endovascular therapy as a first-line treatment. DAVF is a treatable disease, but is undetectable in some cases and this eventually leads to irreversible disease because of the diagnostic delay. In light of a high index of suspicion, MR images should be scrutinized for a flow void cluster and for flow-related enhancement, which are the most common MR imaging and MRA findings, respectively. 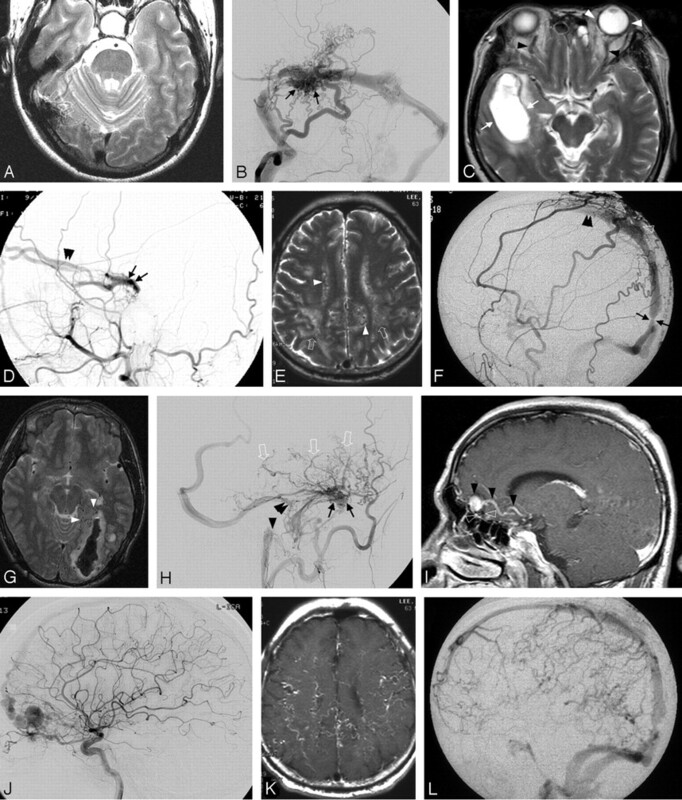 In particular, if dilated leptomeningeal or medullary vessels and prominent vascular enhancements are present on MR images, prompt conventional angiography and endovascular treatment, if indicated, should be performed.